Following the success of Managing Hot Flushes and Night Sweats which outlines a self-help, CBT-based programme for dealing with menopausal symptoms, Myra Hunter and Melanie Smith have developed a pioneering group treatment for women going through the menopause. 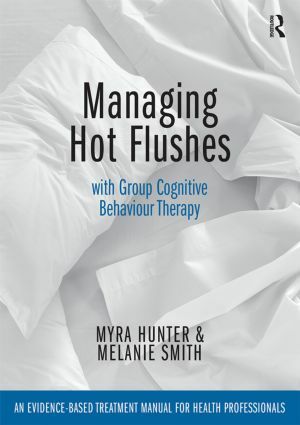 Managing Hot Flushes with Group Cognitive Behaviour Therapy is an evidence-based manual drawing on their research which has demonstrated, in randomised controlled trials, that group CBT effectively reduces the impact of hot flushes and night sweats. The treatment is effective for women going through a natural menopause and for women who have menopausal symptoms following breast cancer treatments and for other groups of women who have troublesome symptoms. This manual provides health professionals with everything they need to run groups to help women to manage hot flushes and night sweats. Managing Hot Flushes with Group Cognitive Behaviour Therapy equips health professionals with knowledge, skills and materials to run groups to help women to manage menopausal symptoms in 6 (or 4) weekly sessions without the need for medication. It is easy to use with a companion audio exercise and downloadable/photocopiable resources on line, as well as power-point slides, homework sheets and diaries. Following Group CBT women have the information, practical skills and strategies to help them to cope with hot flushes and night sweats, and also report improvements in sleep and quality of life. This manual will be an essential resource for nurses, psychologists, counsellors, psychological wellbeing practitioners and cognitive behaviour therapists working in health care and voluntary settings. "Myra Hunter has dedicated her career to working in women’s health and, with Melanie Smith, has spent many years developing and testing the efficacy of cognitive behaviour therapy (CBT) as an intervention to help women during midlife. They have gained considerable knowledge and expertise in this area, identifying what women find helpful and honing the intervention. They have delivered courses to many groups of women who have benefited from this approach to menopause management and have now pooled this expertise into a manual for other health professionals." From the Foreword - Dr Deborah Fenlon, Senior Lecturer, University of Southampton, Clinical Advisor for Breast Cancer Care and Chair of the National Cancer Research Institute Clinical Studies Group for breast cancer working party on symptom management (vasomotor). Myra Hunter is Professor of Clinical Health Psychology at the Institute of Psychiatry, King’s College London. She has worked in the area of women’s health for over 30 years and has over 150 publications including six books. Her research on menopause has established her as an international expert in the field. Melanie Smith is a clinical psychologist, who has specialised in helping people to manage physical health conditions using cognitive behaviour therapy (CBT). She researched and provided the CBT for women with hot flushes in the MENOS trials at King’s College London and is currently with Salford Pain Centre, Manchester.